The latest research from YouGov has revealed that one in every eight Mobile Broadband users have replaced their existing land-line ISP, using their wireless card instead of the land-line alternative. The UK regulator Ofcom which issues a very informative annual report on the state of the market for communication services in UK declared that there were more than 100k+ new mobile broadband connections per month in the UK in H1 2008, with the rate of sign-up accelerating. As many as 75% of dongle users are using their mobile connection at home. Mobile broadband subscriptions in countries like Austria and Sweden are growing at a rate much faster than that of fixed line broadband connections like DSL. Mobile broadband pricing from most of the UK operators are cheaper than the fixed line options (the mobile broadband plans have monthly download limits, though). 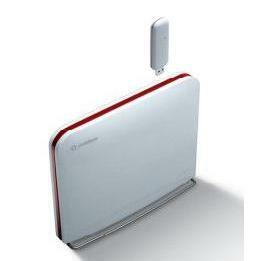 Operators like 3 UK and T-Mobile UK are rumored to come out with 3G routers equipped with WiFi that could be positioned as broadband platforms for the home office – somewhat similar to Vodafone Station a switch/router that has a removable USB key (for 3G/HSPA service) as well as a ADSL2+ port that can be shared via Fixed Ethernet or Wi-Fi across the home (see figure). The USB key can be used for connectivity needs on-the-go and can be inserted into the Station for 3G mobile broadband while back at home. It is not clear how many people will actually use the ADSL2+ service. The implication of all of this is clear: Mobile operators are leveraging the popularity of 3G USB dongles to bite into the market share of the fixed broadband market. According to the Nielsen Mobile report, data cards are becoming an increasingly popular choice for in-home, personal Internet access. While most of these mobile broadband plans come with monthly data allowance limits, how many broadband users would really exceed 5GB data usage in a month? Most broadband usage studies have reported that 5% of the user base generate upwards of 80% of data usage. If you leave out these heavy users, for the casual Internet user, the choice between $60 for tethered home Internet access or $60 for Internet that they can take with them becomes an interesting value proposition. In any case, cable operators in the US are beginning to limit the monthly data usage of their subscribers and it is likely that other fixed broadband operators will follow suit.